Welcome to the Holiday Inn Express Hope HotelExperience a fun-filled vacation when you stay at the Holiday Inn Express Hotel in Hope, AR. 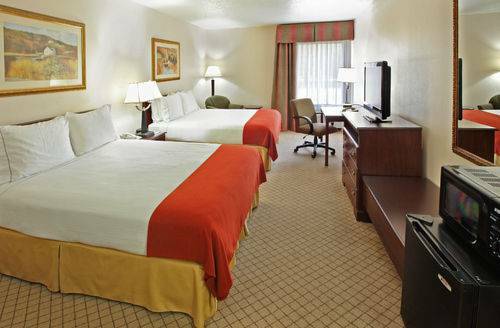 Conveniently located off I-30 near the birthplace of President Bill Clinton, we offer quality accommodations backed by a name you can trust.If you're looking for hotels in Hope, Arkansas surrounded by choice attractions, look no further. The nearby Bill Clinton birthplace is a National Historic Landmark in Hope. Our hotel is also just a short distance from the historic Washington State Park and a 45 minute drive from Crater of Diamonds State Park, where you can dig for your own diamonds.We invite business travelers to take advantage of our hotel's accommodations in Hope, Arkansas. You'll have easy access to local businesses like AMKO, Klipsch Audio Technologies, Tyson Foods and New Millenium. Our well-equipped business center features a computer with free high-speed Internet access, and print, copy and fax services are available, as well. Whether business or pleasure brings you to Hope, AR, our hotel's quality amenities can satisfy your needs. Enjoy a refreshing swim every evening in our seasonal outdoor pool, or relax in our comfortable lobby. And, be sure to join us every morning at the Express Start Breakfast Bar, where you can try one of our signature cinnamon rolls, a fresh cup of Smart Roast coffee and other hot items. Don't forget to ask about our extended stay rates. Book today! Hope Country ClubHope Country Club provides our guests with a 6,035 yard, 18 hole, golf course. Also a 300 yard driving range, tennis court, swimming pool and full service restaurant. It is open 6 days a week. Closed on Mondays. Wal-Mart SupercenterIn walking distance to Hotel. Watermelon Festival (2nd weekend of August)Watermelon Festival in Hope has crafts, music, contests and a lot of the largest watermelons! The best watermelons are grow in Hope area.